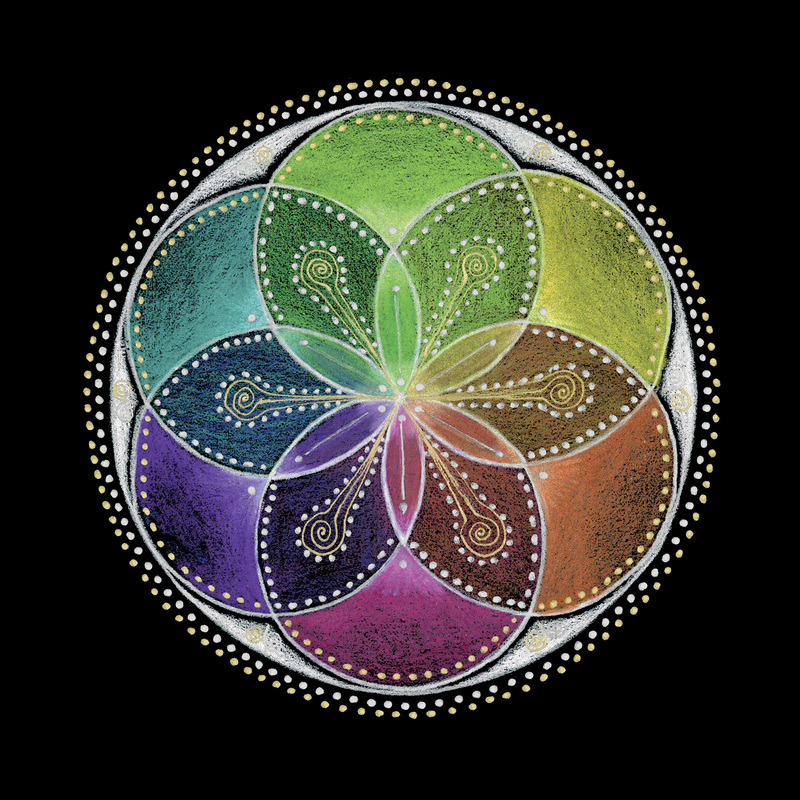 The soul spectrum refers to all the colors of our chakras that come together to form what is known as the light or energy body. The light body is invisible to the human eye, yet can be felt through subtle touch. Light is created by the Sun that generates an electro-magnetic spectrum of light made up of various frequencies and wavelengths of energy. Together these waves represent less than 5% of all matter. Within this 5% only 2.3% is seen as visible white light. Visible light is created by bands of monochromatic light or spectral colors: red, orange, yellow, green, blue and violet. Overlying rays of colored light reform into white light. Higher frequencies create invisible light known as ultra violet or uber violet, meaning above violet. UVA & UVB rays are invisible to the naked eye, as well as X-rays and Gamma rays. Lower frequencies such as microwaves, radar, television and radio waves fall under what we call infrared or below red. Heat is registered in this lower frequency as well. Black is the absence of light or is created by a saturation of colored light. Message: It is time for you to widen your perspective on life by seeing that nothing is just black or white. Between light and dark there are an endless variety of tones and colors that are reminding you to honor all viewpoints and all living beings. Explore the full spectrum of possibilities and be open to all options available to you. Honor the darkness as well as the light, for both will help you radiate with confidence and love. Connect with your luminous nature and let your colorful soul shine! Awaken to your truth as a radiant and colorful soul! HI, I am trying to find out who the artist is who made this mandala. Please advise. Tnx. This mandala is absolutely beautiful. Beautiful! This makes my heart happy!! I would love to have this as a tattoo. Asking your permission to do so.